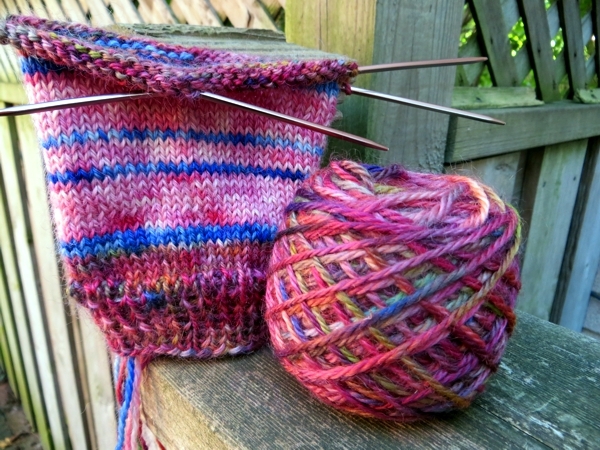 The current Stoddart socks in progress are making me so happy. I cast them on the other night after a super stressful day, when I should have been going to bed but something was on TV that I didn't hate and I just really needed to calm down. 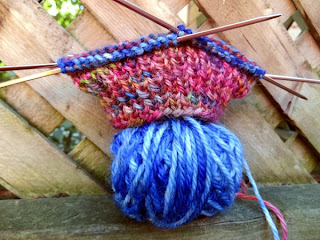 I am telling you, this yarn is the best thing I know for cheering up with. and the next, I did the start of the pink stripe on the first sock, and after that, the rest of it. Mostly because the blue is already divided into two balls, but the pink is just in one, and as a result I can't knit the two sets of stripes concurrently. It's so fast to get a big chunk of Something done in boot sock yarn, I feel like I've packed in a bonus accomplishment at the end of every day since I started them. Love love love these socks, can't wait to wear them, what else is new? Even though I am pretty sure I've knit approximately a thousand and three pairs of these socks and have mostly memorized the pattern I designed for them, I still refer to it for the leg length, heel flap, heel turn, and foot length. Lately I've even taking to scribbling down on the back of said pattern how many rounds are involved for each specific weight of yarn I use for it, to maximize both the limited yarn supplies and the comfort factor of the finished product. And I've lost the paper it's on. Can't find it anywhere! Plus, I have completely forgotten those highly relevant numbers. 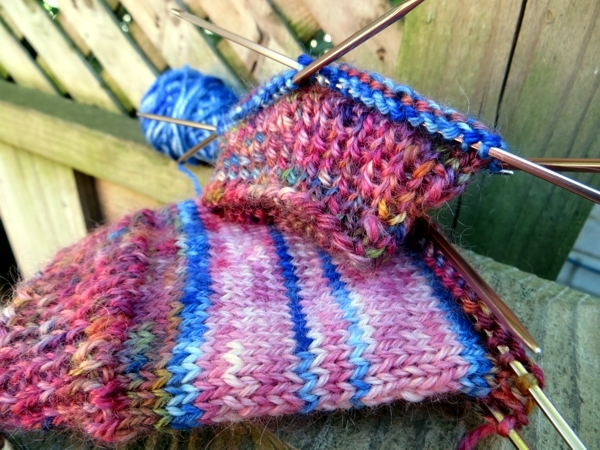 So I am knitting these sock legs on faith and hoping I find it before I get to the end of the legs. Fingers: so very much crossed... I mean, I can always count out the rounds on a pair I knit before, but I know there were some sneakinesses I added at some point for a better fit and I don't remember which socks came after that point. Gah. Hope your day has all its patterns and notes in it - go have a great one, and I'll see you here tomorrow!